After over 4 years of ownership, I felt it was a good time to provide some updated information on the Kobalt lawn mower. My original and complete review on the Kobalt lawn mower can be found, here. Since I purchased the 40 Volt, 20″ model in 2014, Kobalt has some new 80 Volt Mowers. Meanwhile, my own experience with the 40V Kobalt has been nothing but positive since publishing my original review on April 27, 2014. My lawnmower had continued to offer me flawless, trouble-free performance. I recognize, however, from the feedback below that not everyone has had such a trouble-free experience. The main source of complaints seems to stem from battery issues. Some users have reported that the mower stops working for no reason. They remove the battery or place it into the 2nd compartment on the mower and it works fine again for a while. I think I can shed some light on at least half of the issue and that is with the actual batteries, themselves: Since buying the rechargeable mower, I have purchased two other Kobalt products which use the very same batteries: The Kobalt Hedge Trimmer and the Kobalt Leaf Blower. I now have a total of 5 batteries; 4 of them are the regular, 2Ah, and one is the 4Ah Long Run Battery. In the past year, one of the 2Ah batteries has begun demonstrating the same symptoms described in the comments below. Whatever device I am using, whether it is the Hedge Trimmer, Leaf blower, or lawn mower will suddenly shut-off for no reason. I can get it to power up again by removing the battery and giving it a hard slam back into the battery compartment. This very same battery also has trouble charging inside the battery charger. Instead of the normal green flashing light, a red light will appear on the battery charger. The other batteries work fine. Since then, I have marked the problematic battery with a red, Sharpie . This might not explain everyone’s problem with the Kobalt lawn mower, but it could be a simple solution for some of you who are having power issues. Maybe you simply need Kobalt to replace your battery. Give Kobalt a Call. I made a bold decision today and bought a Kobalt Lawn Mower – the 40 Volt Battery Charged Model . I have always been one to jump on new ideas fairly quickly. 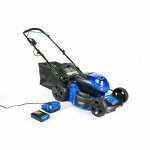 While battery-powered mowers are not exactly new, the larger, more powerful 40 volt and 56 volt lithium batteries are a fairly recent innovation which opens up new possibilities for lawn and gardening tools such as mowers. My 18 Volt Milwaukee drill and Impact driver made a lasting and favorable impression on me and so did my Ryobi, 40 Volt Rechargeable Grass and Weed Trimmer. The big question many of us have is this: Could something as big as a battery-powered lawn mower ever replace the long-time, standby gas lawn mowers that we’ve been using for years and years? I think so. After all, it took a long time for battery powered tools to become efficient and powerful enough to replace corded tools. I imagine the same skepticism existed with even electrical tools when they first replaced manual tools. Most professionals now, use battery-charged power tools almost exclusively. How could something that is quiet, weighs little and makes only a fraction of the noise, be as powerful as the old-fashioned gas lawnmowers ? And how can you expect to keep your lawn in tip-top shape without the handling, noise and smell of good ol’ gas and oil? Can a mower be powerful without the noise? Having taken the plunge into re-chargeable mowers, I have refuted a few of the myths we’ve adopted about about some of our old, gas-powered tools. One, a machine doesn’t need to make a lot of noise to cut your grass. Two, there is enough power to get your lawn cut without having to pull a cord and burn gas. Three, a lawn mower doesn’t need to be heavy to get the job done. Myths aside, are these good enough reasons to replace your conventional gas-powered unit with the Kobalt battery powered lawn mower? The Kobalt, battery-powered lawn mower makes only a fraction of the noise as traditional, gas lawn mowers. In fact, I can be mowing the lawn without worrying about my wife or neighbor wife sneaking up behind me and scaring the daylights out of me. This is only one reason to desire a quiet lawn mower . I have an unwritten rule that I will never mow before 09:00Am on a weekend or holiday as to not wake up any neighbors. The Kobalt mower is quiet enough that I would feel comfortable mowing early in the morning if I had to or felt like it. Hopefully, I won’t need to test this idea very often, except for maybe on one of those predictably, unseasonably hot summer days. To me, this is a big deal. No matter how easy, my corded, gas mower was to pull, the motion of jerking that cord back wreaks havoc on my lower back. There were times when the engine would flood and I would hurt my back pulling the cord to get it started. There is never a concern with that on the Kobalt Battery Powered Lawn Mower . I put the battery inside the compartment; press a button, pull back the handle and the mower is running. My new, Kobalt lawn mower has an impressive pair of grass blades that offer a 20″ cutting surface. As I note in the operations and performance section below, the mower does a great job of evenly cutting the grass. One of the reasons I chose the Kobalt over other battery-powered mowers is that it includes dual-batteries. With its dual battery compartments, both batteries can be installed at the same time. When one battery runs out, the other automatically takes its place. Based on the advertised operating life of these two batteries, I should be able to mow for an hour and 15 minutes using both batteries. That gives me more than enough operating time for my front and back lawns. In the warm days of summer, when my grass is shorter, I prefer to mulch. The Kobalt battery powered lawn mower includes a mulching plug which inserts inside of the back compartment in place of the grass catcher . The grass catcher bag is small, which is fine with me. I prefer to keep some grass for our compost bin and the small bag is easy to install and remove. The mower automatically senses the height and toughness of the grass and only uses the power that is needed to efficiently cut your lawn. This not only saves battery life, but keeps the mower running quiet for most of the job. The rear wheels are larger than the front wheels which makes the mower easier to turn and maneuver. Honestly, I don’t know why all mowers aren’t built this way. Unlike gas mowers , there is no need to worry about emptying the gas tank, changing the oil, spark plug; replacing air-filter or cleaning the carburetor. The mower runs at exactly the same speed; the same way, every time, all the time. I have not owned the Kobalt mower long enough to give a long term review on its reliability, but it does come with a very impressive warranty. The one thing that tipped the scale for me on the Kobalt was learning that it came with a five year warranty directly from Lowe’s. If anything goes wrong, I can take it back to the store for a replacement or full refund. That is insurance you usually don’t get from any product, especially gas powered mowers and other lawn equipment. No product is perfect and so I would like to mention a couple of concerns that I have with my new lawn mower. The mower weights a little less than 50 pounds. It is easier to maneuver than my previous, Self-Propelled Snapper Mower which was a heavy beat. It is light enough that I am comfortable carrying it from my back to front yard, making it unnecessary to have two mowers. Some of the hidden disadvantages of new technology are actually hidden in their advantages. For instance, the light-weight plastic makes the mower a concern for me when it comes to cleaning. When I run over dog-doo (A not so uncommon problem in my front yard), I will not be able to wash it off with the hose. Also, I will have to be careful about mowing wet or damp grass that make it equally difficult to clean. Sadly, the Arnold Power Rake blade I bought two weeks ago, is now completely useless to me. Had I thought about it, I might have even saved one of my old, gas mowers, just so I could continue using the Power Rake in the spring. It seems unlikely that I will be able to find a couple of power-raking blades for the Kobalt Battery-Powered Mower. The trade-off for light-weight operation comes in the form of those cheap, plastic materials that makes all of us a little nervous when it comes to our wish for long-lasting reliability. The frame and construction of the mower seems pretty durable to me. What I worry most about is how well the connections where the batteries snap into place will hold-up over time and the course of many uses. I would imagine that the plastic could weaken over the course of the many times that the two batteries will be inserted and removed over a couple of years. Of course, the five year warranty is nice, but when you’ve got a lawn that needs mowed, who wants to be in the position of putting a broken mower in your car, lugging it back and hoping that the Lowe’s retailer will be in the position to offer an immediate replacement. As you can see, the advantages and convenience of the Kobalt Lawn Mower far outweigh the number of disadvantages that came to mind when I made this initial purchase. Now, allow me to give my impressions of how these advantages and functions actually performed for my first, out-of-the-box lawn-mowing experience. The last time couple of times I purchased mowers, I used a Mini-Van or SUV to haul it to my house. While it is possible to get one in certain cars, they really are pretty heavy. Hauling mowers is also very messy if they have already been used. At least with an electric mower, you won’t have to worry about spilling gas in your car or smelling it up with fumes. I was able to put the Kobalt 20″ Mower on my shopping cart and wheel it up to the check-out stand. While the box did not fit in my trunk, it very easily slid into the back seat of my Honda Accord. Getting the mower out of the box and assembling it was a 10-minute process. If you’re like me and don’t like to read instructions, you’re in luck. The Kobalt mower is extremely intuitive and requires very minimal installation. The only thing that needs to be installed is the top, handle-bar which has a high and low setting. I chose the high, knowing that I could easily switch to low if needed. No tools are required. I removed the batteries and charger from their boxes and experimented with their placement inside the mower. Again, no instructions were required. The placement of the battery was self explanatory. 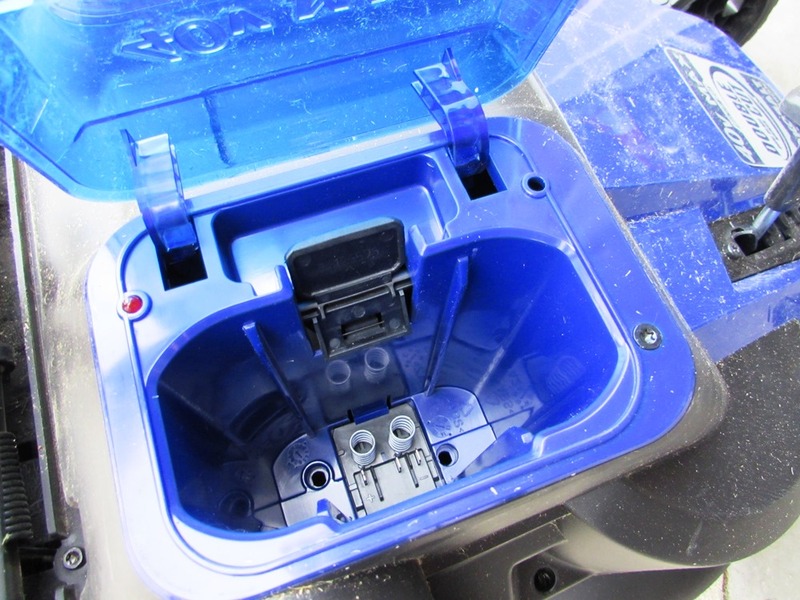 It snaps into place when you push the battery down into its compartment. To remove the battery, you squeeze the connector on top and it pops outs so you can slide it out of the carriage. This is the mechanism that causes me long-term durability concerns, but only time will tell. The mulching plug and bag were also self-explanatory. The mulching plug comes installed inside the mower. When you want to bag, simply remove the plug and insert the small grass-catcher bag. The grass catcher bag actually has a small rectangular lid that falls down when the grass catcher bag is full, letting you know it is time to empty. Discovering this feature did require reading some instructions. Both batteries have a charge indicator button. Pressing it will give you an indication using 1 – 4 lighted dots to let you know how much of a charge is left on the batteries. I noticed that one of the batteries had 2, lit dots. They recommend fully charging the batteries first, but curiosity got the best of me and I went ahead, popped in the battery and started it up. I ran it about 15 seconds and quickly shut down and fully charged the batteries. While the batteries were charging, I decided to mount both the Kobalt and Ryobi chargers on my garage wall. They recommend removing them from areas that are either over 104 degrees or under 40 degrees. I don’t think I’ll have that problem in my garage, but just in case, I will bring the batteries inside during the winter months. Starting the mower is the best part of owning one of these things, or at least the most fun. I inserted the fully-charged, long-run battery in the mower; pushed the round button and pulled back the operation, handle bar. I was skeptical; this seemed way too easy, but sure enough, the motor whirred right up. I immediately noted how the speed of the motor seemed to slow down as it got quieter. I was running this on my garage floor with no resistance to the blade and so I got my first demonstration and proof that the power-sensing capabilities of the mower actually work. Since my grass was fairly short and thin from the winter weather, I was unable to get a real good test of how well the Kobalt does with long, thick grass. Using the grass catcher bag, I mowed both front and back yard and still had two dots worth of battery life left on the single, long-run battery that I used. Not only that, I preserved 100% of my own strength as pushing this light mower around my front and back yard was a breeze and required very little of my energy. Mowing with the Kobalt lawn mower requires no more effort than taking a casual stroll in your yard. It was not difficult carrying the mower down the steps of my backyard. Also, I didn’t have to worry about handling any hot parts. The mower was still cool after mowing the entire front yard. The performance and operation of the mower is smooth and quiet throughout. Though my grass was fairly short, it was evident that the dual blade system does a very smooth and even job of cutting the grass. I will be anxious to see how well these dual blades work when the grass gets long and thick. One of the things I like best about the Kobalt is how easy it is to adjust the height of the blades. There is single lever which can very easily can be moved up or down with one hand. No lawn mower lasts forever, but with proper care, maintenance and winterizing, a good gas mower like a Honda should give you 5-10 years or more of trouble-free performance. Of course, keeping the mower indoors will add years to its life and prevent its metal exterior from rusting. In the past I’ve done very little to help my gas powered mowers. In fact, I rarely even empty the gas or change the oil. I usually get 7 years of life out of them before something goes wrong. I have yet to test the Kobalt electric mower in conditions where the grass is thick and long and I will hesitate to use it even if the grass is slightly damp due to the plastic exterior and electronics which would make it hard to clean. Plastic, however is not all bad. It is light-weight and will not ever rust. The metal handles seem very well made and are not likely to break, snap or bend as some mowers due. 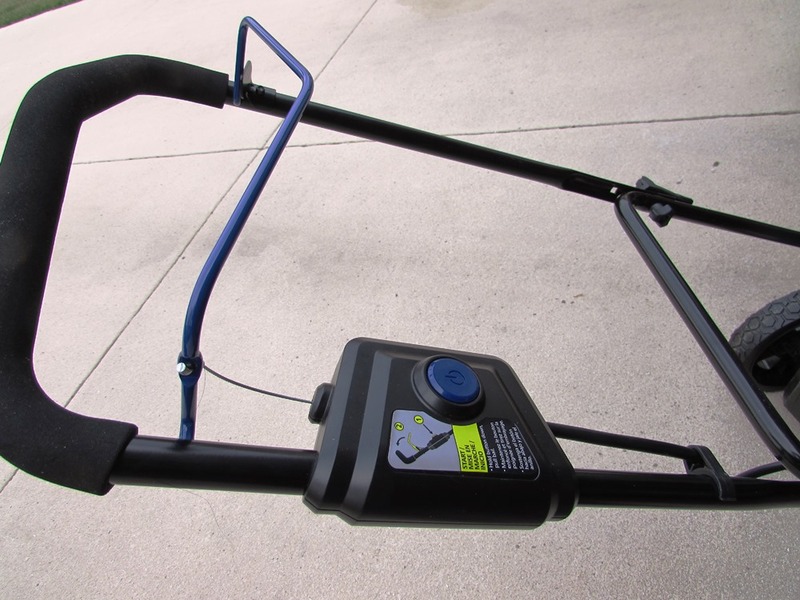 The snap-down levers on the handle bars make the mower very easy to fold up and store for safe-keeping in my garage. Since I sold my two, other gas-powered machines, I am stuck with the Kobalt lawn mower for hopefully many more summers. I will report back on how it does in thicker, longer grass. Please leave me your comments on your own experience with the Kobalt lawn mower. After 14 months of operation, the Kobalt Lawn Mower continues to run great for me. 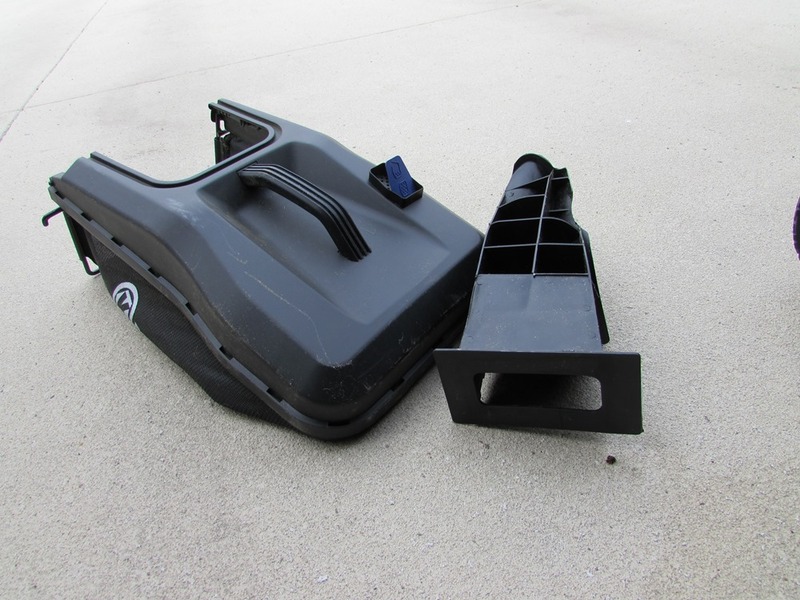 Many of you have experienced problems with the 19″ version of the Kobalt lawn mower. Here are some other brands of cordless mowers to consider. What a terrific, comprehensive review. Very helpful. I agree that your review is comprehensive, and helped me to make my decision to buy the 19″ Kobalt. I love the clean, quite motor, and the finger-tip start. I have a steep grade in my front yard, sloping to the city sidewalk. My hope was that the smaller, lighter Kobalt would help make this slope mowable. Unfortunately not, when the mower is tilted on even a slight angle, it simply stops running. When I mow uphill, it stops running. Battery shows a full charge, grass is thin. I believe the problem is that the battery doesn’t seat tightly enough, and loses contact. It does the same thing in my back yard, which is somewhat bumpy. I am going to take it back to the store and trade it for another just like it, in hopes that this is a fluke. That’s too bad about your problem with the battery. I am loving this mower more each time I use it. It does a great job mulching, even in the the thick, damp grass. The battery snaps very securely into place. Make sure you push it down far enough so it clicks into place securely. Otherwise, I am sure it is just a fluke. Let us know how it works out. I like dawn purchased the 19″ kobalt and the battery problem is not a fluke it is real. I’ve had a problem with mine on level ground and when I contacted service center they told me to return it and exchange it because it is a connection problem related to the latch holding the battery in place. otherwise I love the mower and hope the next one is better. I, too, am having problems with this mower shutting down at the least bump in the ground. On the first use, I thought the battery was new and might not be fully charged. So I charged it for a good 48 hours. After that, it worked well–the 40v battery held for my whole yard. But today (3rd use), it’s back to the same problem. Batteries are well charged, I’ve been able to mow 1/2 of my yard, and now it will start but won’t stay on. I wonder if it overheats? I’ve seen nothing about that in the literature. Or maybe a faulty switch or battery case. I really love this mower, so I hope there is a remedy! Awful!! Lawn mower worked great first time. Second time it cut off before I could get halfway the yard. Waited a minute and it started back up. Ran a minute and cut off again. Over and over it did this!! Packing it up and back to Lowe’s!! I, too, have had the same problem. I have only used the mower 4 times and this was very frustrating. Thank you all for your posts. 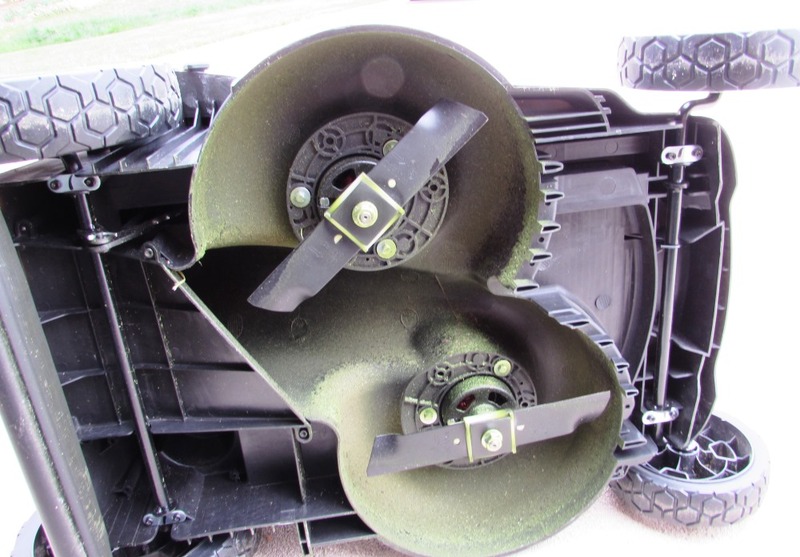 Just want to chime in on the 20″ dual blade mower cutting in thick and tough grass. I live in south florida where the grass has gotten tough and thick from the recent rains. i performed my first cut at level 2 and used the mulching feature. It seemed to beat down the grass, but i chalked it up to early morning dew and grass still wet. My second cut ( week and a half later) went much better also on mulching feature. Much cleaner cut. My third cut I used the bagging feature and i must say i cut front and most of the back on the quick charge( 2ah) battery. This mower is getting better with every use. For those that feel they can’t switch to a battery operated mower should give it a try. If you don’t like the feel and performance of the mower simply return it ( with receipt) and continue with the gas, oil, pull the string and make an appointment with your doctor. For those of you who have had problems with the Kobalt Lawn Mower, I believe you. I sympathize with your frustration. Since the original complaint, we’ve had a few more people complain of similar problems. Those of you who have complained, could you please let us know if it was with the 19″ blade or the dual 21″ blade model? That might help us narrow this down. My own experience has continued to be extremely positive. Based on the 7 or 8 times I’ve used it, I wouldn’t even think about going back to a gas mower. But, I also understand that quality control can often be an issue, especially on new products. Hope we can get this figured out. I believe re-chargeable electric mowers are the way to go. Thank you for your comments. We bought the 19 inch version and have the same problem of the mower cutting out . It would start again when I would take the battery out and then would quit again when jostled . Pretty frustrating. When it it is running it does a good job and is wonderfully quiet. I have had the same problem with this mower. It has to be a connection problem with the battery. I bought this mower last year because my arthritic hands cannot pull the rope to start a regular mower. It’s going back, too much aggravation! Mine is the 19 inch. Came across your page after searching for info on if the mower overheats. Love the pushbutton start but I’m on my fourth battery today trying to finish my corner lot. Height is set on 3 because if I go any lower it dies in 10 minutes. I sure am sorry for all the problems people are having with the 19″ mower. Has anyone at all had a problem with the larger Kobalt Mower? I am a little gun-shy now, but so far, mine continues to run like a dream. Yes, I have the 20″ this mower was hassle free the first 4-5 times I used it. Today it refuses to keep running and I just charged the batteries. That is disheartening to hear. I don’t like to rub it in, but my experience with the Kobalt mower has been nothing but excellent. With all of these complaints, I have to say that I think they have some problems in the quality and reliability department. I hope you get your situation resolved. Keep us posted. Yes, yes yes. Just used my mower for the first time and cannot get the battery out. I have the 80 volt larger model.Help.. I cannot get the battery out, too. I also have the 80 volt model. I was wondering if anyone has responded this issue. I’ve used my 20″ model several times now, and have had no problems with it. This unit has plenty of power, especially with the power boost it switches on in heavy grassy areas. I also like the fact that I don’t have to worry about having gas stored somewhere for the mower, and there’s no stinky / explosive smell to contend with. So far, I consider this to be a good investment. Same issue with my 19″ model stopping. very intermittent…. any solution??? Bad battery connection and firmware? I took my 19 inch back to Lowes today because it would not star at all. Apparently there is a recall for this model and it has been discontinued. I traded it for the 20 inch model, my cost plus 10% of the difference between the models. Very easily done, in and out in 20 minutes. Thank you, Kowes. Same problem with the 19″. Won’t run. Going back to my store which is 125 mile round trip. Very inconvenient. I had the same cut-off problem with my 20″ Kobalt mower after mowing a 1/4 acre of grass once a week for the last 3 months. Took it back to Lowes and was refunded my money. I wanted another Kobalt 20″ mower but, Lowes was sold out of the mower. I will be back at Lowes next season to get another 20″ Kobalt. I liked the mower, Lowes and the 5-year hassle-free warranty. I have a lawn mower that was used during this past summer and attempted to use it today with fully charged batteries and it did not start. Any advice? Well, it’s been since Nov 2014, and you’ve likely found an answer or like me, hired a landscaper for one more season. Bought one 19″ last Spring, problems in the Summer but wanted to wait for Lowe’s to stock a replacement. 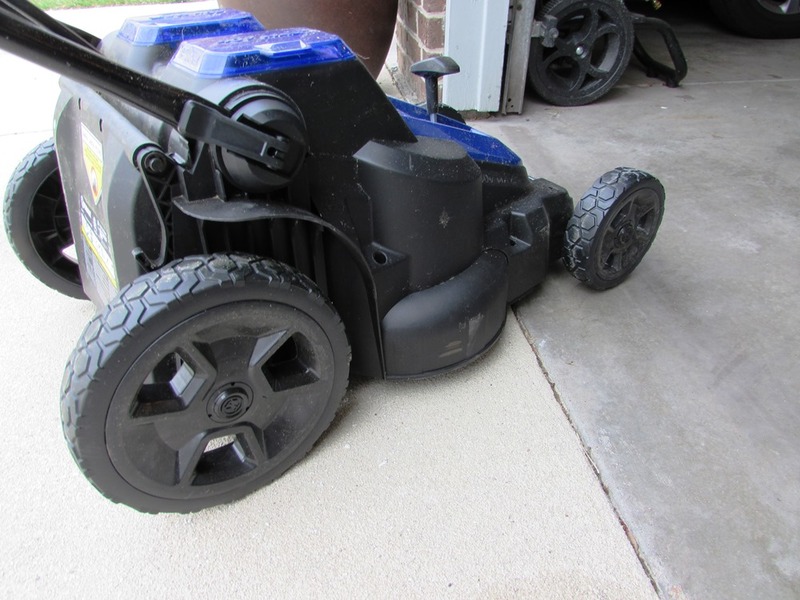 Returned it about a month ago and with a “little hassel” got Lowes to replace it with the new & improved 19″ mower. It quit the first time I used it. Think its a battery fit problem because a rag and bunge cord over the first one fixed it. A no hassel guarantee is nice but I need a no hassel mower. I just purchased the 19in and am having the same problems with it cutting out after half of my small lawn is cut. I have had it stop even sitting still not moving it ran for like 30-45 sec then stopped again. I have only used it twice and its done it both times. I can’t find anything about a recall on the 19 inch mower. Mine is doing the same thing. I’m sure it is a battery connection issue. She’s making the trip back to Lowes. I’ve purchased the 20″ and it does fine on my front lawn that I use with the rear bagger. I don’t bag on the back yard (field) and I am going to try the mulching feature today. I mowed half the back yard with having to recharge the battery a few times, thick grass, and set on a lower grass height. Why doesn’t Lowes fix this problem? I exchanged one, new one does the same thing. I am extremely sorry for the problems that so many people are having with the Kobalt 19″ Mower. I feel additionally bad knowing my extremely positive review here enticed many of you to make a decision that you probably now regret. It is really too bad. My 20″ dual-blade model has continued to run trouble-free. I have been very impressed with the way it has very smoothly and effortlessly mowed the wet grass I’ve had as a result of our extremely rainy May and June thus far. I have never had a better mower and would never go back to gas. Still, I feel for your heartaches and hassles that you’ve had and I sincerely hope that you can get them resolved. Please keep us posted here. This seems to be the number one place on the web to learn about the Kobalt Mower, both good and bad. Wow!! I cannot believe Lowes has let this go on for so long! I bought my first 19 in. in August 2015, worked well the first time, used the lawn mover for 1 hour without a problem. Then the second go round 2 weeks later was a disaster, kept stopping every 1-2 minutes. Tried it again, after trouble shooting the next week, same results! Well, I gave Lowes a little grace, felt it may be a battery/connection problem, I took it back and got a hassle free replacement (thanks). I really like the concept of the cordless electric mower. However almost the same result with the second 19 in. mower. Now that I have done some research into these mowers, I am very disappointed that Lowes has done absolutely nothing to fix the problem. I am going to give Lowes one last chance by upgrading to the 20 inch (seems to have less bad reviews), if that fails Greenworks and Black/Decker may have better options. I would suggest Lowes sends those of us who did their beta testing on this product a generous discount certificate on our next purchase. Based on the comments here, Victor, the 20″ unit seems to be trouble free. I think you’ve made a wise decision. My cordless 20″ Kobalt has given me 3 summers of great operation. Would never go back to a gas mower. 20″ kobalt battery operated . Used it today first time mowed quarter back yard had some tall grass not wet. mulching. stopped no reason. Charge good. Cleaned under hood 4/build up mulch. Started again few seconds died. repeated cleaning. Try to start it will not start. Sounds like both 19 &20″ defective. Just bought a 19″. One the first run yesterday it ran for about 20 minutes and then quit. Thought the battery might need recharging (shouldn’t have). Then the battery would not charge at all. What a piece of junk! I had the Worx WG 788 36V mower. We liked it a lot for many of the reasons in this review. When the battery died after 4 years (2.5 season of use but sat for 2 years while in a rental) we discovered Worx not only discontinued the model but only had 21 batteries on order. The cost of replacement would be $222 for a lead acid battery with a 1 year warranty. Be ware of obsolescence. The comments here give us pause about getting a Kobolt. I agree . Thank you for the info very usefull. I was contemplating on getting battery operated again but not with kobalt. This battery operated stuff is not perfected too many kinks. Certainly will be getting cord now. Was nice to find this, I just purchased the Kobalt 20 inch dual blade (Which is actually made by Greenworks), have not had a chance to use due to raining the past couple of days, so this will be a real test as the grass will be thick and moist, I was able to get Lowes to price match the Greenworks one at 339.00, same mower just green. But wanted to get the Lowes due to the hassle free 5 year warranty. I hope I made the right choice, my switch is a bit different as i am moving from an 18 inch corded electric mower, got tired of the cord, but I was skeptical of the battery powered ones, tomorrow should be a good day to test. I will try and follow up with my review and update. I have the 19 ” 40w electric it does a good job, but it is very frustrating that it stops all the time. It stops in seconds few steps then stops it starts up then stopped. I get the feeling it’s the Variable Automatic Power Sensing feature. If there is an override I would like to know. I would rather recarge the battery More frequently than have to keep stopping every 10 steps. We have had our 19″ since June 2015. Excellent mower. We love the quietness of it, the easy start, and the power. We have a small yard so we were not looking for anything industrial by any means. The summer of 2015 the mower operated perfectly. We started having battery issues this season which prompted my search online. I researched the warranty and noticed the battery has a 3 year warranty and the mower itself was 5. I went into Lowes and explained what it was doing. They said, just bring it back in and we will replace it. They pulled my receipt from my credit card. WOW! I was so impressed. From what I read above most are having a better experience with the 21″ however we opted for the 19″ again but if we have issues with this one again, we will swap it out for the 21″. I was so impressed with Lowes’s customer service. Despite the upset we felt of having issues one year after purchasing the mower, the fact that we had a hassle free return, truly made a difference. I know this isn’t a LOWES customer service page, but if this helps anyone, then I am glad. I have used to 20″ kolbalt mower for about three years. I had good luck with mine and its light weight has helped make the slopping part of my yard easier to tackle. Recently fully charged batteries are not working n the right bettery compartment but work fine in the left battery compartment. I just learned of the recall so far will be checking if my model is affected by the recall. Otherwise, I guess I should return under warranty as searching the Internet has not revealed anyone else experiencing the one battery compartment issue. I am having the same issue, have had mine for about 4 years now. I have been using my Kobalt 40V cordless mower for 4yrs. know only issues I have is I cannot get it low enough to scalp the grass for winter lawn seeding and right after the warranty expired the switch that switch to the second battery compartment when the first one ran dead stopped working. Still going strong though and am considering going to the 80V to see if i can get it to scalp the lawn short enough to seed for the winter lawn. I’ve had good luck so far with my 19″ for a year or so but I put in a charged battery, It starts, runs for maybe 5 seconds then cuts out. Will do that several times but only runs for 5 seconds…. It seems to click in ok and the battery is definitely charged. Frustrating. I am going to write an update paragraph on the battery issues which seem to be the biggest problem with the Kobalt Mowers. Stay tuned. My 40-volt 20″ has a single blade and is self propelled. I used it once and hit a small rock. It destroyed the mower, because of the light weight plastic housing that covers/protects the drive motor.